I think it must be every photographer’s dream to have their work featured by National Geographic. And that dream came true for me this week. National Geographic recently contacted me, asking for in interview about my work. We had a great conversation about the genesis of this project, how I tend to work, the art of making photogravures, and more. The result is today’s feature on their website: an article about my series Astra Velum, and the thought and process behind it. I’ve always been shy because of my freckles – I have them all over my face, arms, shoulders and back. When I was young they were much darker and obvious, I’ve been teased and bullied so many times. Thank you for making me feel less self-conscious about them! This kind of response makes my work that much more rewarding. It’s one thing to make work that I enjoy creating; it’s quite another to see it make a positive impact in the world. Beauty is only skin deep. But ah! me; freckles go to the bone. Liedtke’s Astra Velum is a series of photogravures: intaglio prints created in a printmaking studio. These moody, luminescent prints truly must be seen to be appreciated. This show includes new work in the series, not shown before. The Lishui Photography Museum, in Lishui, China, just finished showing 60 images and stories from the Skeleton in the Closet series. The staff there translated all the texts for this solo show, which viewers found very moving. They also featured an 8 page article in one of China’s premier photography magazines. You can view more of the work (in English…) on the website, or by purchasing a copy of the book on Amazon. I was pleased to learn that the Suzzallo Special Collection at University of Washington recently added my altered book Faerie Queene to their collection. Many thanks to the wonderful Laura Russell at 23 Sandy Gallery for helping them make the addition! This altered book consists of a carved book, painted endpapers, platinum print photograph, ink, tarlatan, text. The Huffington Post featured an article on my book Skeleton in the Closet today, in honor of Eating Disorder Awareness Week. Twelve images accompany the article, which you can read here. Several photogravures from the Astra Velum series were juried in to the Alternative Processes show at SoHo Photo, in New York City. Geoffrey Berliner, Executive Director and co-developer of the Penumbra Foundation, was juror for the show. Liedtke’s portraits demanded attention. Small photogravures, they’re portraits of young faces that manage to both yearn outward and pull inward. I frankly can’t get the eyes of “Asia” out of my head. These are works where the process not simply supports the subject of the imagery, but animates it. The clarity, the intensity, and the sure lines of the features remind us that photogravure is not simply the process for the fantastical or ethereal as it seems to have become today (think the ParkeHarrisons), it also allows a measured precision and texture that is hard to replicate. It’s almost impossible to imagine a silver gelatin print representing the freckled skin of Fritz’s “York” with such complete richness and honesty. If Liedtke can pull a photogravure like “Asia” and “York,” one wonders how other artists might reclaim and remake lost processes, and the exhibition, like other process exhibitions, helps us imagine what all we’ve left behind when we turn toward contemporary printing. Mural painting in rural Guatemala with a team of artists, and with Yolanda. 2014 was a busy year for art and artmaking. I started off the year teaching art in Italy for 3 months, and ended it painting murals in Guatemala. Mural painting in Guatemala really was a new venture. I’ve painted, and I’ve photographed, but I’ve never taken one of my photographs, turned it into a mural design, and painted it 9 feet tall on a hospital wall. In Guatemala, I did this 7 times, sometimes 30 feet up in the air! My friends and I were working in a children’s hospital in rural Guatemala. Children are brought there severely malnourished, and often with serious disabilities. (The girl featured above, Yolanda, was both severely malnourished, had Type 1 Diabetes, and is deaf and mute. But she’s also wonderful.) The amazing people at the Hope of Life Hospital nurse them back to health at no cost to the families, and send them home with education and food to help prevent further problems. We wanted to create images that inspired hope, and created a welcoming environment, for these traumatized children and their parents. The results were surprising even to us, and everyone was very pleased. While in Guatemala, I took an afternoon to drop in on my friends at La Fototeca. The work they do bringing top-notch photography to Guatemala City is really impressive. And their open-armed welcome made me feel like a rock star! Thousands of photographers from China and oversea get together and participate in the show. More than 100 artists’ work are presented to the audience of Shanghai people and photographers from around the world. High Noon Fine Art presented five American artists’ portfolios: Debora Schwedhelm, Fritz Liedtke, Heidi Kirkpatrick, J. Scriba, and Susan Kae Grant. The Haggerty Museum of Art is currently showing “Scrutiny After the Glimpse,” which includes two of my photogravure portraits from the Astra Velum series. Depicting the human form has been a primary focus of artists since the beginning of recorded engagement. Looking at a portrait or figure painting has usually been thought to be an isolated occasion with a finite meaning. This exhibition of paintings, drawings, prints, and sculpture from the Haggerty’s permanent collection explores the potential of these objects to evince multiple meanings based on context and proximity to other works. View the show at the Haggerty now through August 3, 2014, in Milwaukee, Wisconsin. Publishers Weekly today posted an interview with me about Skeleton in the Closet: “The Human Condition: PW Talks with Fritz Liedtke.” Back in March, Publishers Weekly gave the book a starred review, and included a writeup of it in their print magazine. Fritz Liedtke’s Skeleton in the Closet collects portraits of people who have suffered from eating disorders, each of the photographs accompanied by writing from the subjects. The book earned a starred review from PW Select, with our reviewer calling it “by turns heart-wrenching and redemptive…artful and humanizing” and stating that Liedtke “[treats] each subject in a unique and sensitive fashion.” We spoke to Liedtke about the importance of going out of one’s way to publish difficult or unclassifiable subject matter, and the lasting connections between photographers and those they photograph. Read the review on Publishers Weekly here. Purchase your own copy of the book on Amazon here. 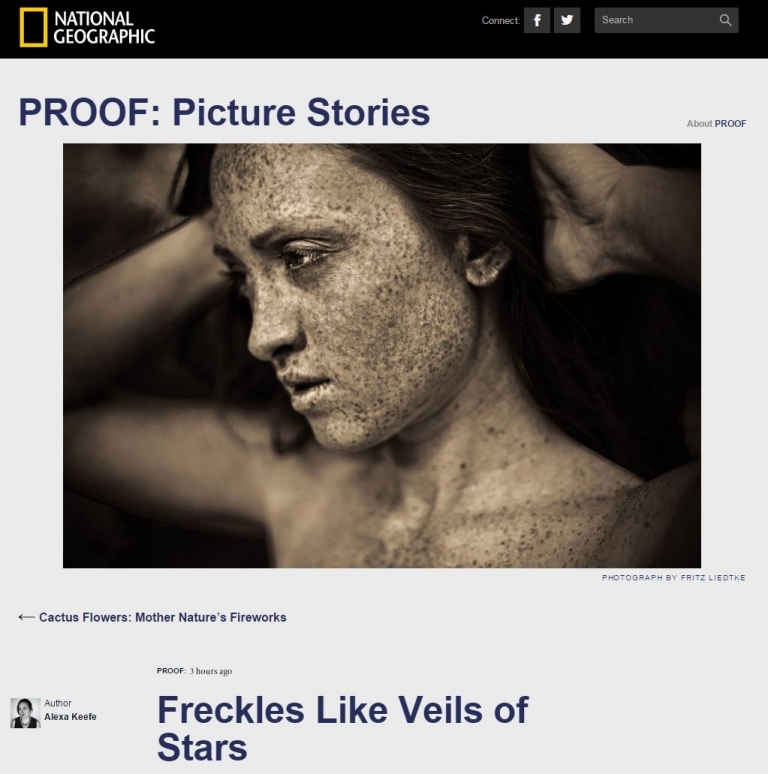 LensCulture editor Jim Caspar today selected Astra Velum as an Editor’s Pick, and featured it on the front page of the site. If you’re not familiar with LensCulture.com, you probably should be. It’s one of the best places to explore contemporary fine art photography from around the world. Read articles, view portfolios, browse projects, and much more, all in an easy-to navigate and beautiful site. The Astra Velum feature can be found here: https://www.lensculture.com/articles/fritz-liedtke-astra-velum. Start there, and then explore the wide world of fine art photography! This past year, I was approached by Wally Mason, chief curator at the Haggerty Museum of Art in Milwaukee, Wisconsin. He loved the Astra Velum photogravures, and inquired about adding a few pieces to the Haggerty’s collection. I was impressed by Wally’s intimate knowledge of his own collection, and his desire to add pieces to it that fit well. I appreciated his desire to steward artwork–to care for and show it well, rather than just stick it in a vault. After some discussion, the museum selected 4 pieces, which were accessioned into their collection this past fall. You can view them here.